Can I make a dues, fee, or other Sorority payment for my daughter? Yes! Parents can view bills and make payments on behalf of their daughter using Billhighway. Billhighway is an easy-to-use online tool designed to help chapters manage finances, budget, bill members, collect funds, and manage their membership. Billhighway makes it easy for you to make a payment for your daughter. Billhighway accepts both e-checks and credit cards, you can even pay via Facebook, mail, or phone. For more information on Billhighway, including how to make a payment, please visit their website. Can I recommend someone for membership? Yes! Learn how you can recommend a potential new member. All new members will have to meet Alpha Sigma Tau’s requirements for membership. Does Alpha Sigma Tau have a New Member Education Program? Yes. Alpha Sigma Tau’s New Member Education program teaches new members about the history, values, and aims of the Sorority, and helps Sisters get to know one another. New members also complete GreekLifeEdu, a self-paced, online learning tool to educate members about making positive, healthy choices. Does Alpha Sigma Tau have a risk management policy? Yes. Alpha Sigma Tau’s risk management policy addresses risks with alcohol and drug use, hazing, sexual abuse and harassment, and health, fire, and safety. How do I log into Not Anymore and Greek LifeEdu? Logging in is easy! Learn how to log in to Not Anymore here, and to GreekLifeEdu here. How do I order a new or replacement Badge? How do I start an alumnae chapter or association in my area? You can learn more about starting an alumnae chapter or association by clicking here. Using the “Member Login” link at the top of this page, log in to AΣT Connect, Alpha Sigma Tau’s secure web portal for members. Then click “My Information,” update your information, and click “Save My Information” at the bottom of the page. How do I volunteer as an alumna? There are several ways you can volunteer. (1.) First, see if there is an alumnae chapter or association in your area. There are typically many leadership and other volunteer opportunities there. (2.) Consider volunteering at national level. Check out our volunteer positions, and submit an application. (3.) Consider serving a collegiate chapter as a Chapter Advisory Board member. Contact Justina Solties at jsolties@alphasigmatau.org or 317-613-7572 to learn more. I am not a member of the Sorority and my aging mother recently passed down her Badge and other sentimental Sorority items to me. I don’t know what to do with the items. Should I send them to Headquarters? Each member of Alpha Sigma Tau Sorority makes a lifetime lease of the Badge from the Sorority during the Alpha Sigma Tau Sorority Initiation Ritual Ceremony. It is the policy of the Sorority that the Badge is either (1.) buried with a member when she enters Eternal Chapter, (2.) reverted to Alpha Sigma Tau National Sorority through the Alpha Sigma Tau National Headquarters to be held for a future family member who may join the Sorority, or (3.) archived, depending upon the member’s wishes. I haven’t been involved with Alpha Sigma Tau since I graduated. What is a good way to ease into getting involved again? There are several ways, but here are a few great first steps: (1.) Update your contact information by logging into AΣT Connect to ensure you’re receiving the latest communications; (2.) locate your nearest alumnae chapter or association; (3.) consider attending an upcoming event; and (4.) visit a Sister you haven’t spoken to recently. Then reconnect and share the photo on social media. I haven’t received any form of correspondence from the Sorority. How do I stay in the loop? We probably don’t have your most current, up-to-date contact information. Update your contact information by logging into AΣT Connect. Also be sure to follow Alpha Sigma Tau on Facebook, Twitter or Instagram. I often see Badges with charms hanging from a chain. What are those and how can I get one? The chain, known as a chapter guard, attaches to your Badge and has your chapter affiliation on the other end. Many members choose to dress up their Badge with dangles that represent their officer positions, honors, awards, and more. 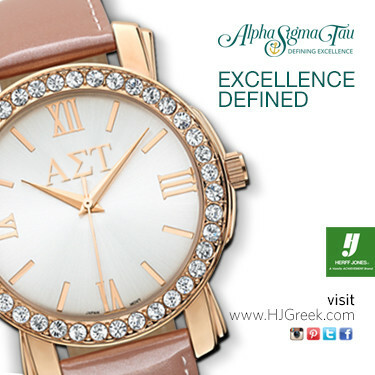 You can order yours through Herff Jones, the Sorority’s official jeweler. I’ll be in Indianapolis and would like to visit Headquarters. Is it possible to get a tour? We would love to give you a tour of Headquarters! Contact headquarters@alphasigmatau.org or 317-613-7575 with details of your trip, and someone will return your message. We try our best to accommodate any member’s request for a tour. Is Alpha Sigma Tau a member of the National Panhellenic Conference (NPC)? Yes, we have been a member since 1951. The National Panhellenic Conference is an umbrella organization of 26 national and international sororities, and one of the oldest and largest women’s organizations in the world. Alpha Sigma Tau proudly adheres to all of NPC’s policies on recruitment, extension, operations, and other important areas, which makes for a richer, more positive experience for our members. What is the time commitment of being a member? After the new member period, chapters host weekly chapter business meetings which all members are required to attend, along with other social, recruitment, philanthropy, and Sisterhood events of the chapter’s choice. What’s the difference between a colony and a chapter? A chapter is a fully-installed and chartered affiliate of Alpha Sigma Tau, with all the rights and responsibilities thereto. Joining a chapter is a unique opportunity to tap into and be enriched by an existing Sisterhood. A colony is a brand new chapter-to-be on a college or university campus. Colony members spend approximately one semester building what will become a chapter including the recruitment of members and the election of officers. They are then formally installed as a chapter. Joining a colony is a once-in-a-lifetime opportunity to be a founding member of a Sorority chapter and build a Sisterhood from the ground up. Who should I or the chapter on my campus contact with questions? All chapters have a designated Headquarters Staff Contact who can answer questions that you or members of the chapter may have. Collegians may access their contact’s information on Officer Portal, and campus professionals may call Alpha Sigma Tau Headquarters at 317-613-7575.